Harrogate Town made it three derby wins out of three, beating local rivals York City by a 2-1 scoreline to seal their progress into the second round of the FA Trophy. Lewis Hawkins should have put the Minstermen ahead in the 18th minute, however a defensive mix-up on the edge of the Harrogate penalty area soon afterwards culminated in Alex Bray beating home goalkeeper James Belshaw to the ball and slotting into an empty net. I’m disappointed with the goals conceded, although it’s always difficult to come from behind against teams that have pace on the break. Town’s response was swift enough and the scores were levelled shortly before the half-hour mark. Dominic Knowles got on the end of a bouncing ball into the left-hand channel, using his body well to hold off marker Joe Davis as he advanced towards the edge of the box, from where he bent a delicious right-footed strike into the bottom corner. The hosts should have been ahead before the interval, though Joe Leesley sent the ball out of the ground when it looked easier to score from Jack Muldoon’s pull back. The second period began in scrappy fashion, strong winds and pouring rain no doubt playing their part as both teams struggled for fluency on a freezing cold afternoon. 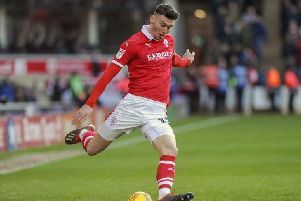 Knowles fired just wide from 25 yards before Leeds United loanee Liam Kitching turned the game on its head in the 66th minute, lashing into the roof of the net following a scramble from a corner. Belshaw did have to save from York substitute Macaulay Langstaff in the closing stages, but Town were good value for their victory in the end. York boss Sam Collins felt his side deserved at least a replay. Ben Tomlinson marked his return from injury with the winning goal as FC Halifax Town beat Barrow 2-1 in the FA Trophy. Town captain Matty Brown had scored at both ends to seemingly set-up a replay on Tuesday, but Tomlinson came off the bench to mark his first appearance for three-and-a-half months with the decisive goal two minutes from time. The road to Wembley is literally and metaphorically a long way from the bleak mid-winter in Barrow, but The Shaymen beat the horrendous conditions as well as a plucky Barrow side. Town’s pressure was building as half-time approached, and after Andrew Firth reacted quickly to turn behind Jordan Preston’s cross-shot, Brown headed in the resulting corner. Barrow nearly responded immediately but Luke Burgess’ header was just wide from Connor Brown’s cross. Sam Johnson continued to mainly be a spectator as Barrow struggled to create chances, but watching on was all the Town keeper could do when Lee Molyneux’s delightful angled chip hit the bar. The momentum swung Barrow’s way though when Brown – presumably trying to nod the ball back to his keeper or out for a corner – inexplicably headed into his own net. Barrow’s Jacob Blyth and substitute Jack Barthram then hit the post within two minutes but Tomlinson got the final touch to divert fellow sub Jonathan Edwards’ shot past Firth and break Barrow hearts. Farsley Celtic manager Adam Lakeland was left proud but defeated as his Evo-Stik Premier League side lost 4-3 to National League North outfit AFC Telford. Telford took the lead against the run of play through Daniel Udoh but Farsley got the goal their play deserved when Nathan Cartman bundled home. Ryan Barnett and Jon Royle gave Telford a two-goal advantage but Celtic were not done yet, Jack Dyche heading home Lewis Turner’s cross. And even when Henry Cowans restored Telford’s two-goal advantage, Dyche looped aheader home to ensure hosts could not rest easy. “I’m disappointed with the goals conceded, although it’s always difficult to come from behind against teams that have pace on the break.